1. Who Are The Coaches?2. What Is Cross Country?3. What Do I Need To Sign Up?4. Can Athletes Participate in Two Fall Sports?5. When/Where are Practices?6. What Is Endurance Camp?7. How Do I Join Elementary Cross Country?8. How Are Captains Chosen?9. What Equipment Is Necessary?10. What Can I Do About Nagging Injuries?11. What Should I Eat?12. How Can Parents Help?13. Can I Take My Athlete To/From a Meet? Coach Miller has been the head coach of the middle school cross country team since the team was founded in 2008. Coach Miller ran cross country and track at Lake Park High School from 1995 to 1999 and was captain of his cross country team. The Lake Park track team won state during his sophomore year and also won state in 2010, 2011, 2012, and 2013. He still runs regularly and ran his first marathon in the 2008 Chicago Marathon. He has run the Chicago Marathon a number of times as well as the Illinois Marathon in Champaign/Urbana and the Naperville Marathon. Coach Miller was an assistant coach on the high school track team working with the junior varsity distance runners from 2010 to 2015. He is currently a computer science teacher at the high school and also a sponsor of the high school robotics team. Coach Austin has been with the middle school cross country team since 2016. Coach Austin attended Hinckley–Big Rock High School from 2002-2006 where he participated in soccer, basketball, and track. He continued his running career at North Central College, running for legendary Coach Al Carius, and was a member of three national championship teams his senior year (cross country, indoor track, and outdoor track) while earning an individual All-American award his senior year in the 800 meter run. 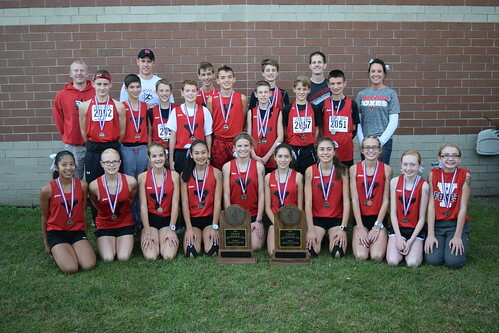 While at North Central, Coach Austin fell in love with the sport of cross country and is very excited to be part of the Yorkville Middle School coaching staff. He continues to run in local half marathons and stays active by playing basketball and volleyball. Coach Austin is also the head coach for high school boys track team. Coach Calder has been with the middle school cross country team as a volunteer and coach since 2016. Coach Calder teaches English at Yorkville High School and has been running for over ten years. She has completed countless half marathons as well as run the Chicago Marathon multiple times, and Grandma’s Marathon in the spring of 2018. She assisted the Yorkville Middle School cross country team for two years before becoming an official assistant coach and also coaches YMS track in the spring. Coach Martin has been an assistant coach for the cross country team since the team was founded in 2008. Coach Martin ran track at Lena-Winslow High School from 1995 to 1999. He has been a cross country coach since the program was founded at Yorkville Middle School in 2008 and he is also the head coach of the Yorkville Middle School track team in the spring. He is currently a physical education and health teacher at the middle school. Robert Cool (2011): Coach Cool was a volunteer coach during the 2011 cross country season at the middle school. He left Yorkville after the 2011 season but offered to volunteer in 2012 even though he was no longer working for the school district. Mickey Nauman (2012-2015): Coach Nauman coached at the middle school from 2013 through 2015 and was also a volunteer during the 2012 season. She also coached distance runners on the middle school track team. She gave up coaching after the 2015 cross country season to have more time to watch her sons, Alexx and Zack, participate in cross country at the high school. Brian Long (2016): Coach Long never actually coached at the middle school since he took a job on the high school team a few weeks before the season started. He did work with the middle school during Endurance Camp during the summer of 2016, however. Kerry Stillmunkes (2016-2017): Coach Stillmunkes worked with the team during the two years her son Jack was on the team. She also worked on the track team and Endurance Camp those two years. She moved on to help the high school team after Jack went to high school. 2. What Is Cross Country? Cross country is a popular sport that involves running on a course that may consist of grass, mud, trees, and water. Yorkville runs as a part of the Illinois Elementary School Association (IESA) so we can participate in the state series consisting of a Sectional race to qualify for State. The IESA has stated that middle school athletes, both boys and girls, run a two-mile course during their meets and all of our conference meets will be two miles. Boys and girls normally do not run in the same race, but the Tiger Trails Invite in Oswego sometimes combines boys and girls at the same grade level. Scoring in cross country is different from many sports since the lowest score wins. A team consists of seven runners with the top five scoring points for their team. Points are earned based on the place earned, so if the top five runners for a team finished in 1st, 5th, 10th, 14th, and 20th the team would have scored 50 points. The 6th and 7th runners are important in case of a tie and they can also hurt another team's score by beating their top five runners. Although the top seven runners are important in cross country, most cross country meets feature an open race that allows any number of participants. There are no cuts in cross country so if you show up to practice and follow all team and school rules you will be able to run in the meets. We believe all of our runners are important to the team so when our team wins a trophy everyone who ran in that race should go up to accept the trophy whether they were the first runner in the race or the last. 3. What Do I Need To Sign Up? For seventh and eighth graders, the sports information packet is required along with a $65 activity fee and a current physical. The only thing that needs to be turned in on Registration Night is the cross country registration form. The form can be filled out electronically and emailed to Coach Miller if you cannot make Registration Night on Tuesday, May 22. You can still sign up for cross country even if you miss Registration Night, though. We will accept new runners through the end of the first week of school. Fifth and sixth graders should see the section on Elementary Cross Country since there are different requirements. 4. Can Athletes Participate in Two Fall Sports? We understand that cross country may be a new sport for many of our athletes, which is why we do allow athletes to participate in cross country in addition to another sport as long as the other sport is not a school sport. School sports practice at the same time so no one can participate in more than one school sport during a season. School sports that conflict with cross country include boys soccer, girls volleyball, eighth grade football, and eighth grade football cheerleading. Our conditions for multi-sport athletes are that they be at cross country practice every day unless there is a competition for the other sport. If there is a cross country meet that conflicts with a competition in the other sport, the athlete may choose which competition to attend. However, the athlete needs to inform the cross country coaches at least a week ahead of time if they will not attend a cross country meet since rosters need to be submitted early for meets. Participating in two sports during the same season can be done, but it should only be attempted if the athlete plans to give their best in both sports. Please contact Coach Miller if you have any questions about multi-sport athletes. Cross country practices will be held from August 5 through August 9 at the Yorkville High School Academy track from 7:00 to 8:45am. Once school starts on August 13, practices will be held at Yorkville Middle School from 2:45 until 4:30pm through October 7. Runners who qualify for Sectionals and State will run for an additional two weeks to prepare for the State meet on October 19. Any runners who run at our Conference meet on October 8 can also choose to run for these additional two weeks. Saturday practices will be held at Silver Springs State Park at 7:00am whenever a meet is not held that day. Thursday practices starting September 12 will be held at different forest preserves. Practices are normally scheduled for 1 hour and 45 minutes. The exception is the first day of practice, which will be two hours. Some practices may involve shorter runs, but the rest of the time will be spent doing endurance drills, recovering, body weight lifting, or playing games. Check our team calendar for a more detailed practice schedule. On Wednesdays during the school year most of the coaches have meetings after school. On those days, practice will start 30 minutes later at 3:15 and Coach Austin will get the team started with warm ups. Practices on these days will end at 5:00. While students are not in school on October 11, October 14, and October 15 these dates are during our postseason so it is important that our postseason runners be available for those days. If you are considering a trip during that time, please contact Coach Miller to determine if your runner could be eligible for the postseason. 6. What Is Endurance Camp? Yorkville's Endurance Camp is a summer camp run by the coaches of the Yorkville High School and Yorkville Middle School cross country teams. The Yorkville Endurance Camp will provide participants with guided distance training, based on the ability of each individual. In no way is experience or talent a prerequisite for the camp. Training will include a variety of workouts, each of which will take into account the capabilities of the athlete. Endurance Camp is highly recommended for every cross country athlete. All registration forms must be turned in to Coach Muth at the high school by May 31. The cost is $100 for the summer and checks can be made out to Yorkville High School. Family rates are available for 2 runners ($160), 3 runners ($210), and 4 runners ($260). Endurance Camp will run from June 17 through July 18 every Monday, Tuesday, Wednesday, and Thursday from 7:30am to 9:00am with no camp the week of the Fourth of July. The camp will be held at the high school track. We will hold a free cross country minicamp the weeks of July 22 and July 29 on Monday, Wednesday, and Friday for runners who intend to run middle school cross country. It will be from 7:00am to 8:30am, but runners will need to return this signed waiver to participate. The waiver will also be handed out during Endurance Camp to interested runners. 7. How Do I Join Elementary Cross Country? An intramural cross country program was created for the four elementary schools starting with the 2014-2015 school year. Elementary runners practice three days a week starting the second week of the school year, and participate in at least three meets during the season, ending with the Fox Trot Invite in October. To sign up for elementary cross country, please fill out the intramural brochure. The brochure can be turned in to your elementary school. The cost for just cross country is $25, and you can see the brochure for pricing for multiple sports. The head coaches for elementary cross country are Kelli Williams at Autumn Creek, Kelly Bachewicz at Bristol Bay, Julie Devine at Grande Reserve, and Maggie Davis at YIS. 8. How Are Captains Chosen? Our team usually consists of over 70 seventh and eighth grade runners so it is important we have quality captains to help the team run smoothly. Captains will help run warmups during practice and will need to make sure the team prepares correctly on the day of a meet. Captains will also help keep track of cross country equipment, such as foam rollers and lacrosse balls, to make sure everything is returned at the end of each practice. Runners who are interested in becoming a team captain need to fill out a captain application and get it to Coach Miller by the end of the first week of practice. Captains will be chosen by the coaches after the first week of practice based on their efforts over the summer and at the start of the season. We always choose a mix of athletes so you do not need to be a good runner to be a team captain, just a good leader. 9. What Equipment Is Necessary? Runners should never run in cross trainers or basketball shoes. Running with improper shoes can quickly lead to an injury. Running shoes at the middle school level will probably last a year, and should be replaced after that amount of time to prevent injury. If you don't yet have a new pair of running shoes or spikes, you may want to wait until Spike Night on the first Friday of the season. We will have a team party at Naperville Running Company and learn a lot about choosing the right shoes. 10. What Can I Do About Nagging Injuries? During the cross country season everyone will feel sore at one point or another. You should be using our training log to track how you are feeling on run. Cross country is a difficult sport and you will be using your muscles in new ways so soreness should be expected. Normal soreness means your muscles are rebuilding and gaining strength. We highly recommend purchasing a foam roller, lacrosse ball, and/or massage stick to massage sore muscles. While a professional massage of the sore muscles would be the best option, it is too expensive for most at the middle school level to do on a regular basis. A foam roller, lacrosse ball, or massage stick is a decent substitute for a massage. The middle school team has a supply of all three items, but they cannot be taken home by athletes. Ice can also help for sore muscles or other injuries. We recommend athletes put ice on the injury/soreness as soon as possible after their run. They should only keep the ice on the affected area for 15 minutes. They should also ice the area for 15 minutes before going to bed. If you feel the same pain on both sides of your body it is most likely just sore. However, if the pain is specific to one area of your body or if it otherwise seems more serious, we suggest having a doctor or physical therapist look at it. Yorkville Middle School has a partnership with ATI Physical Therapy that allows our athletes to get a free consultation and advice for any injury they have. Just make sure you let ATI know you run for the cross country team and they will help you out for no charge. You can contact ATI at 630-283-6177. If you prefer a chiropractor to a physical therapist we recommend Dr. Jeffrey Schutt who has worked closely with Yorkville's cross country and track teams in the past as a volunteer. Dr. Schutt also founded Don Beebe's House of Speed with the former NFL star and worked with the University of Illinois football team so he has a lot of experience with sports injuries. You can contact Dr. Schutt at 630-553-1876. 11. What Should I Eat? Our Nutrition Page has all the information you need to know about eating during the cross country season. A good diet will not only keep you healthy, but it can drastically improve your race times so it's a good idea to use the information on our Nutrition Page to your advantage. 12. How Can Parents Help? We always need help during our home meets. We will need help at the end of the race, and we may also need people on the course to direct the runners so they don't get lost. We will do our best to let you watch your athlete run. You can volunteer at a meet by filling out our Volunteer Form. We also love getting pictures from our meets. The coaches don't have time to take a lot of pictures during meets, so most of the pictures we have are those taken by parents. You can upload pictures to our Flickr page by emailing Coach Miller for our Flickr account information. Another thing all parents can do is leave our team tent as a place for runners to escape the craziness that is a cross country invite. We ask that our team tent be a place for just coaches and athletes so the athletes have at least one quiet place they can go during a meet. This does not apply to our weekday meets since we normally do not bring our tent to those meets. 13. Can I Take My Athlete To/From a Meet? Yorkville Middle School athletics follows the same policy as the high school when it comes to driving athletes home from competitions. Any runners who do not plan on taking the bus home from an away meet must fill out a release form. Runners cannot ride home with anyone other than members of their immediate family unless prior approval is given by our athletic director, Jeff Perzee. This form must be given to one of the coaches on the day of the meet. Approval must also be obtained from Mr. Perzee if you plan to drive your athlete to an away meet as opposed to having them take the team bus. Runners who do not take school transportation to an away meet without prior approval cannot participate in that meet. Runners do not need to fill out a release form to leave a home meet or practice and can get a ride home from people outside their immediate family. There is no school-provided transportation after a home meet. In addition, since the Fox Trot Invite is on a Saturday at the high school, there is not transportation provided to that meet. Even though athletes may go home with their parents after a meet, we highly encourage athletes to stay for the entire meet and go home with the team on the bus. Team chemistry is an important aspect of cross country and bus rides can help build that chemistry.